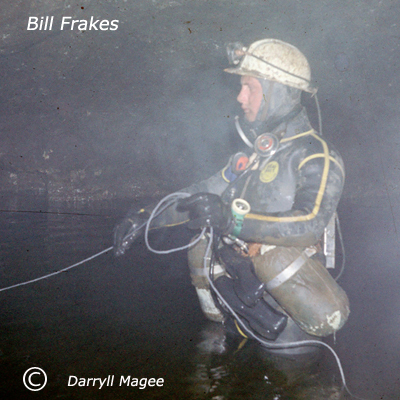 This was my first cave dive using breathing apparatus and as far as I am aware, this dive was also the first cave dive made by Bill using diving apparatus. Twelve months earlier Bill had passed the short sump in Elbolton Cave by free diving and he had free-dived a short sump in Rumbling Hole (Leck Fell) He had also been stand-by diver for Pete Livesey at Stonelands Cave (Littondale) but had not been required to dive. The Divers: Bill Frakes, Mick Melvin, Dave Stewart, John Russum. Dave Cobley and Chris Whelan of the B.P.C. assisted on the carry into the sump. As we only had three sets of diving gear it was decided that Bill and I would make the first dive and return to base. Then John using his own diving gear, would dive with Dave using mine. Our objective was to explore the cave beyond the sumps with the intention of assessing the feasibility of scaling the 45 foot aven reached by Mike Boon in September 1963. We also made a decision to replace the existing line through the sumps with a new Courlene dive line. The cave passage as you come up to the first sump is a water filled canal, with the roof of the cave sloping downwards into the water and forming the 45ft. sump. After I had donned my diving gear I submerged myself in the canal leading to the sump to test my headlight, air supply and buoyancy. I felt a tap on my helmet and raised myself up to see what had happened. Bill who was standing in the canal next to me asked “what are you doing?” I thought the answer obvious but replied “I am checking out my gear before the dive” At this he muttered something about me wasting air and he began to sing the words of the latest release by the Rolling Stones (The Last Time) I include this anecdote not to denigrate Bill, simply to reveal the humour of the man. It was decided that I would dive first, if all went well on reaching the far side of the sump, I would carry on crossing the small chamber (Higham Hall) linking sump one and two and dive through the next short sump 10ft. into the stream passage beyond. I would then signal for Bill to follow with three sharp pulls on the line. 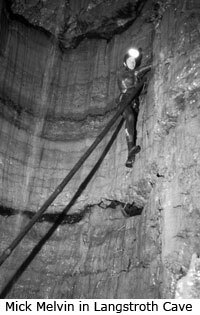 The main sump begins with a short duck into a cross rift where the guide line was belayed. From the cross rift I dropped to the floor of the passage and in good visibility was able to see a roomy underwater passage leading away in front of me. As I moved into the sump the left hand wall was close at hand but I was unable to see a wall over to the right. The reassuring nylon line lead away in front, beckoning me forward. Passing under a flake which arched down from the left, I rose to the roof of the passage to keep in contact with the line as it hung against it. I made good forward progress and keeping my eyes on the line, I was surprised to see it rise upwards and disappear into the solid cave roof. This unexpected sight made me stop momentarily in the water and I began to move my right hand forward along the line to where it had disappeared. As my hand reached the roof of the cave, first my fingers, and then the whole of my hand followed the line into the roof of the cave passage and I did not understand what was happening for a few seconds. Swiftly I realised what I was seeing, and moving forward pushed my helmeted head against the object above me. I broke the surface coated in the scum which had covered the surface of the sump pool in Higham Hall, scum which from beneath had appeared as a solid roof. I crossed the floor of the chamber in thigh deep water to the second sump 10ft. which I dived through without difficulty to reach the large chamber first entered by Alan Clegg on May 17th 1963, Sedbusk Hall. I gave the required three tugs on the line and Bill was soon standing beside me slapping me on the back and saying well done! Removing our diving kit we made our way along a fine stream passage for about 60ft. to the bottom of a very impressive shaft with a large stream falling 45 feet from the lip of a noticeable cave passage above. We spent some time at the foot of the shaft, where we discussed the prospect of ascending it with maypoles at some time in the near future. After coming to a decision that the shaft could be climbed with the use of maypoling techniques, Bill and I returned through the sumps back to base, from where John Russum and Dave Stewart dived through the sumps using our gear. During the course of the dives we replaced the existing Nylon guideline with a new Courlene line. N.B. On later diving trips into the cave we found two other air-bells in the main sump. I believe that the sumps are now free dived using these air bells. CDG Diving Review 1963, pages 10-11. CDG Diving Review 1964-65, pages 48-49. White Rose Pothole Club, 1965 Newsletter No.58,page 2.